Newspaper clipping from the December 25, 1981 edition of India Abroad. The article, titled "Freedom Fighter, 91, Dies," provides an obituary for Mahesh Chandra Bansal. Newsclipping from the October 2, 1981 issue of India Abroad, featuring an editorial titled “Relevance of Gandhi,” by Dr. Manmohan Mehra. 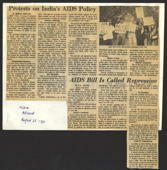 "Protests on India's AIDS Policy" / "AIDS Bill Is Called Repressive"
"2 Beat Musician in Racial Attack"
"U.S. Sikh Leaders See Long Fight"
"Balancing Sovereignty and Sikh Honor"
"Visit Appraised by Coast Leaders"